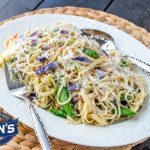 Pasta is an easy, go-to dinner for busy weekenights but don’t forget you can add lots of colour, flavour, and extra nutrition to your dinner by adding in some fresh veggies! 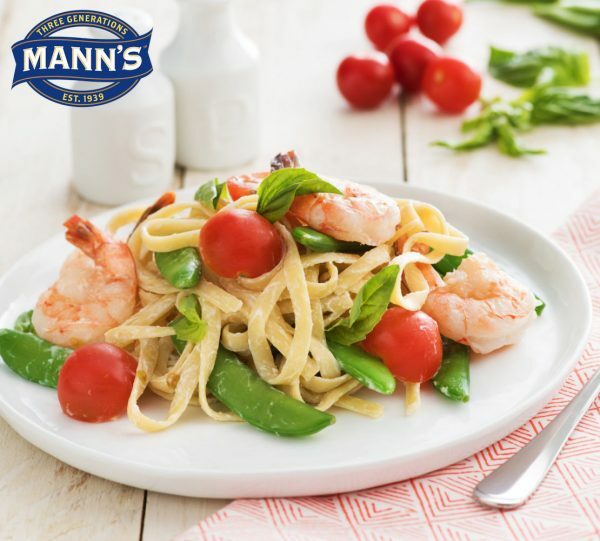 Stringless sugar snap peas and cherry tomatoes are an easy addition: simply rinse, and toss in while you’re making the sauce and you have a bite of freshness to go alone with your creamy shrimp & basil fettuccini. Cook fettuccine in large saucepan of boiling water for 8-10 minutes until al dente. Drain and return to pan. Heat olive oil in large frying pan on medium. Add shrimp. Cook, tossing, for 2-3 minutes until opaque. Add Mann’s Sugar Snap Peas, cherry tomatoes, cream, basil, chili flakes and garlic. Cook, stirring for 1 minute until heated through. Toss through pasta. Season to taste and enjoy. 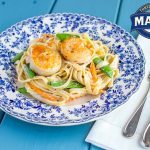 This recipe was sponsored by our featured member, Mann’s!